A statue at the Houhai markets. Photo courtesty of Kate. One of the perks of participating in the InterExchange Teach Intern and TEFL Training program is that there are some pretty cool outings included in the cost of the program. Even in the shorter, six-month TEFL training program, we were given a guided tour to the Great Wall, the grounds of the 2008 Summer Olympics, and several local markets, all in the first week after arriving. It's still the middle of winter here, so the cold can be pretty unforgiving if you don't give it proper attention. On tour day, all 47 interns piled on a chartered bus wearing every hat, coat, scarf and glove we could collectively lay hands on. Our tour guide told us about the bloody, colorful, and repetitive history of the Great Wall during the 90-minute bus ride to the tour stop. When we arrived at the wall, the girls all raced straight to the bathroom, as you might expect after a long, early-morning bus ride fueled by caffeine and excitement. After our relatively modern dorm room bathrooms, the toilets at the Wall were something of a surprise. While two of the stalls had what we later learned the locals call "Western Style Sit Toilets", most were what looked like a small shallow toilet bowl (sans seat) set into the ground with places for your feet to either side, designed for squatting rather than sitting. We had heard that these were the norm in China, but this was the first time some of us (myself included) had encountered them. I guess this will be something to get used to when we go out to our placements in the provinces! 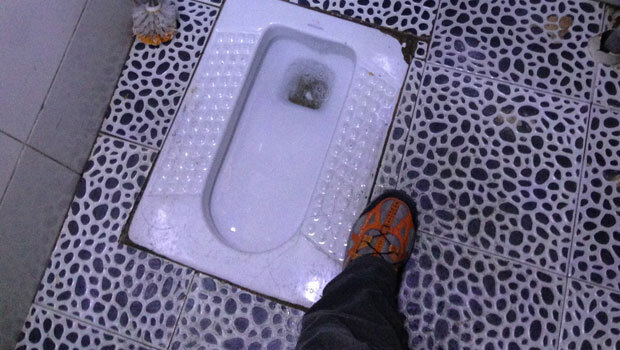 The Squat Toilet (and my shoe). Photo courtesty of Kate. We spent several hours climbing around at the Great Wall on our own, enjoying a thousand different views and gasping like untrained marathon runners the whole time. This part of the wall is steep, made up almost entirely of stone steps that take visitors up the side of a mountain through several small guard houses built in to the wall. My calves ached for two days after this trip! After enjoying the iconic tourist experience at the Great Wall, we ate lunch at a factory that produces Cloisonné, and has a restaurant upstairs. We visited the Olympic grounds briefly, but the real highlight of the day was our visit to the Houhai Market. 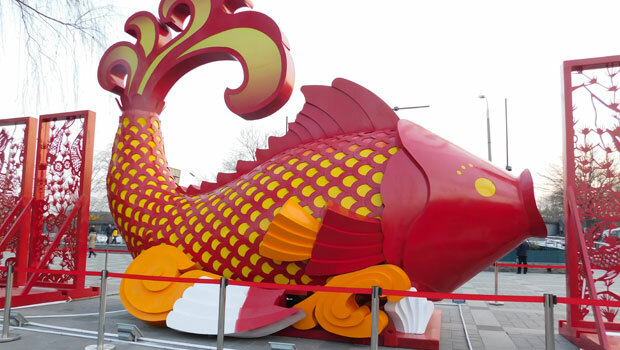 We were greeted by a statute of a huge red fish, and enjoyed watching Chinese families out enjoying the sunny day by ice skating at the entrance to the market area. 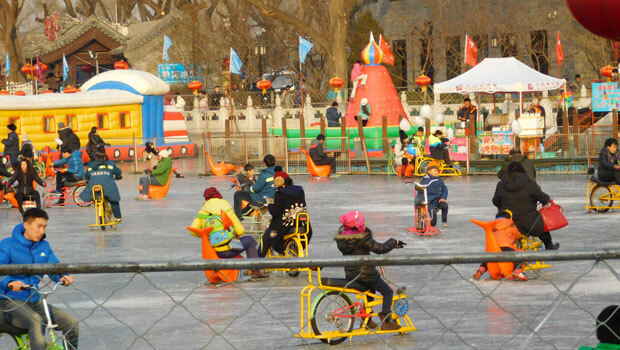 I laughed to see people riding around the ice on bicycles and chairs with skates built on to the bottom. The fish at the gate of the Houhai markets. Photo courtesty of Kate. Ice "skating". Photo courtesty of Kate. The market itself was full of strange foods, fragrant tea shops, and often-funny signage. One of our group joined the locals in a bizarre test of manhood by stripping to his skivvies and jumping into a pool formed by a hole cut in the frozen lake where the ice had been chipped away. All I could think was "Better him than me!" but he did get a lot of congratulatory pats and shouts in Mandarin from the crowd who gathered to watch. A few days later, we all went to visit a night market near downtown Beijing. May I just say, what a trip! 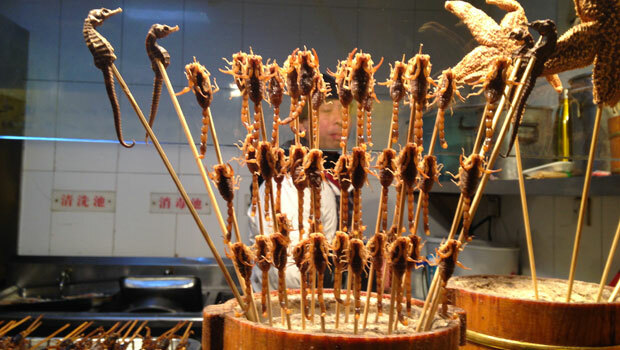 All kinds of weird food (fried seahorses!) and dodgy souvenirs were for sale at outlandish prices, set for haggling. We had a lot of fun cheering the bravest among us on as they sharpened their negotiation skills. Crazy market food. Photo courtesty of Kate. 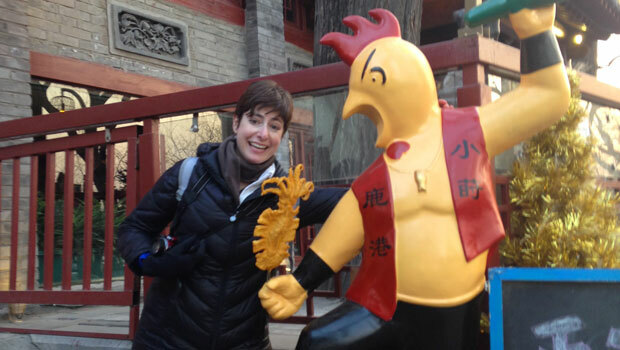 Kate is a participant in the InterExchange Teach Intern & TEFL Training China program. 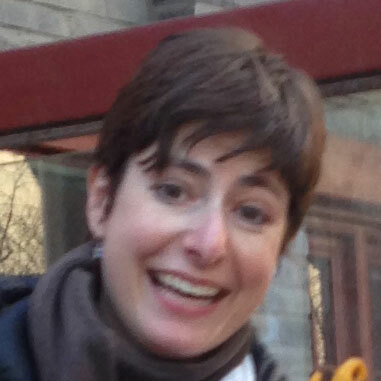 Kate is a participant on InterExchange's Teach Intern & TEFL Training China program.